Going beyond race-blind approaches to spatial segregation in Europe, Racial Cities argues that race is the logic through which stigmatized and segregated "Gypsy urban areas" have emerged and persisted after World War II. Building on nearly a decade of ethnographic and historical research in Romania, Italy, France and the UK, Giovanni Picker casts a series of case studies into the historical framework of circulations and borrowings between colony and metropole since the late nineteenth century. By focusing on socio-economic transformations and social dynamics in contemporary Cluj-Napoca, Pescara, Montreuil, Florence and Salford, Picker detects four local segregating mechanisms, and comparatively investigates resemblances between each of them and segregation in French Rabat, Italian Addis Ababa, and British New Delhi. These multiple global associations across space and time serve as an empirical basis for establishing a solid bridge between race critical theories and urban studies. 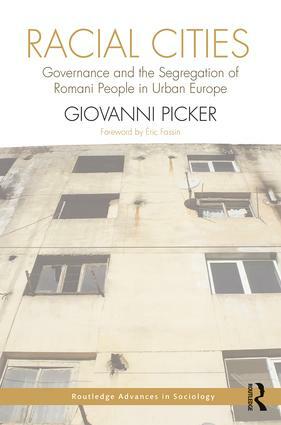 Racial Cities is the first comprehensive analysis of the segregation of Romani people in Europe, providing a fine-tuned and in-depth explanation of this phenomenon. While inequalities increase globally and poverty is ever more concentrated, this book is a key contribution to debates and actions addressing social marginality, inequalities, racist exclusions, and governance. Thanks to its dense yet thoroughly accessible narration, the book will appeal to scholars, undergraduate and postgraduate students, postdoctoral researchers, and equally to activists and policy makers, who are interested in areas including: Race and Racism, Urban Studies, Governance, Inequalities, Colonialism and Postcolonialism, and European Studies. Racial Cities, in its remarkable intersection of diverse strands of thought, demonstrates how the persistence of everyday colonialism roosts in Europe through the ordinary and proliferating segregations based on race continuously reinvented within the problematizing of Gypsy urban areas. In elaborating the racial complexion of European urban life, Picker emphasizes how the ordering of urban space remains reliant on the way specific territories are constituted to give body and visibility to open-ended threats, on the ways in which the rationales underlying segregations can be dismissed, remade, or rendered self-evident, where political deliberation is substituted by technical considerations, and where unyielding convictions about fundamental differences can silently operate through multiple vernaculars. Racial Cities sounds a vital alarm over everyday and institutionalized racism and discrimination vis-à-vis Romani people, defined at once as a scourge and threat, in a race-blind Europe. Not only does Giovanni Picker draw needed light to the "organizing logic" and specificity of race, biologized as culture, in neoliberal states from the East to the West, he also illuminates how Romani segregation is a conspicuous lived-reality—hidden in plain sight—that indexes a naturalized and under-analyzed anti-Romism, and thereby a distinct yet familiar race question in Europe. Capturing the nexus between practices of expulsion and disposable confinement, Picker reinforces the fact that space is indeed raced. "Racism is not a problem"
Giovanni Picker is a Marie-Sklodowska Curie Research Fellow at the University of Birmingham School of Social Policy, UK.